GPCC CEO Todd Sanders speaks to attendees during the GPCC Capitol Conversations event Dec. 8 at the Arizona State Capitol. 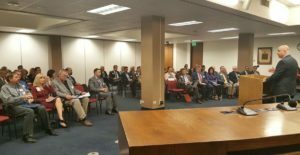 Key Arizona lawmakers shared insight and predictions on hot issues for the upcoming legislative session with business and community leaders during the Greater Phoenix Chamber of Commerce (GPCC) Capitol Conversations event Dec. 8 at the Arizona State Capitol. Senate Majority Leader Kimberly Yee, Sen. Bob Worsley, Rep. T.J. Shope, Rep. Heather Carter, Rep. Reginald Bolding and Joint Legislative Budget Committee (JLBC) Director Richard Stavneak discussed several vital issues including economic development, infrastructure, education and the state budget with event attendees. Yee opened the event with a very well-received direct message for the business community. GPCC President and CEO Todd Sanders provided welcome remarks and GPCC Public Affairs Vice President Mike Huckins gave a quick update on the Chamber’s recent Executive Dialogue trip to Washington, D.C., where Phoenix-area business leaders met with Arizona’s congressional delegation to discuss their priorities and hear what Arizona’s representatives and senators hope to accomplish early on under the new president. The audience broke into smaller workgroups to discuss issues of importance to the business community. Each group featured a lawmaker or agency director discussing issues looming large for businesses, including growing the economy, funding transportation infrastructure maintenance and construction, adequate education funding and responsibly managing the state’s budget. Rep. Heather Carter and Rep. T.J. Shope led a group discussing economic development. They are united in their opinion that the best thing business community members can do is to reach out to develop personal relationships early in the year. They’re more likely to pay dividends later. Sign in with your name and your organization’s name on bills. Shope looks at that prior to voting. They both value highly having trusted people with whom to discuss bills covering areas in which they are not experts. They have to vote on all bills. The business community makes a natural partner with the Legislature to promote Arizona and build the talent pipeline. Greater Phoenix Chamber of Commerce should categorize members by legislative district so lawmakers can have smaller group discussions about priorities with businesses in their districts. Sen. Bob Worsley led the infrastructure discussion, which centered on the idea that Arizona’s transportation system has been neglected for at least a decade. Worsley advised that the time is now to make substantial investments to maintain and grow this vital piece of the economic development puzzle. Final recommendations from ADOT’s Key Commerce Corridors Plan will be presented Dec. 21. The plan calls for $20 billion investment over 20 years. The gas tax has not been changed since 1991; we’re about $6 billion behind. Worsley believes Trump wants to invest $1 trillion into U.S. infrastructure. He’s looking to Gov. Doug Ducey to enact a plan after seeing federal recommendations to maximize matching federal dollars for Arizona. Rep. Reginald Bolding led the education discussion, which, as the largest portion of the state budget, looms large in negotiations each year. Bolding’s concerns include maintaining education funding now and crafting a solid plan to keep it going into the future and attracting and keeping quality teachers. Proposition 123 is concerning because it places a cap on education spending, whereas there are no caps on other substantial budget items such as corrections and health care. We need to determine a plan to fund K-12 and universities adequately. Universities are asking for Arizona to cover 50 percent of in-state tuition. The public needs to know that there is a teacher shortage and we need to promote Arizona as a great place to live while acknowledging our education challenges. Richard Stavneak, director of the Joint Legislative Budget Committee (JLBC), noted that his agency uses the state’s statutory, or required, spending requirements to set the budget framework for the Legislature and governor to set policy and determine the discretionary portion. He anticipates only a small amount of room for discretionary spending in the upcoming budget year, adding that states are bound by a balanced budget requirement. Arizona’s rainy-day fund is at 6 percent. Credit rating agencies recommend 8 percent. Base revenue growth was slightly lower than anticipated in the fiscal 2017 budget. JLBC uses four forecasting models to create its forecast. A 1 percent forecasting error can result in millions of dollars, positive or negative. Forecasts are challenged by ongoing litigation against the state. Budget will be impacted in the near future by one-time fiscal 2017 spending, ballot proposition requirements, a phase-in of full-day kindergarten, university funding and any tax reductions. – Written by Josh Coddington, marketing and communications manager, Greater Phoenix Chamber of Commerce.